Take the ingredients in a bowl or plate and mix them. In a bowl; place the egg, oil, Seltzer and milk. Mix them with a whisk. You will use this mixture between each layer of the pastry and for the top of the borek.After greasing the Pyrex dish, place two or three layers of pastry/1 yufka on the bottom and let it go out over the sides of the dish. Spread 3 tbsp of the mixture all over and place some of the filling you are using and spread it evenly. Take the other 2-3 sheets of pastry/1 yufka and wrinkle them up in order to fit to the dish (see the picture). 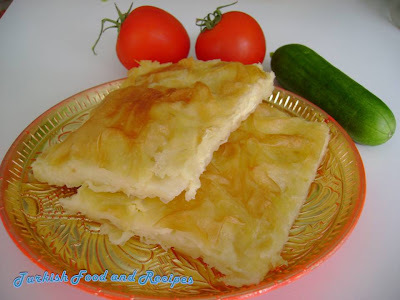 Continue layering in the same way; first the liquid mixture and then the filling.When you place the last pastry sheets/yufka, fold the sides of the bottom sheet over the borek. Cut the borek into desired size squares. Sprinkle with nigella and sesame seeds. Pour the remaining liquid mixture on top of the borek evenly.Preheat the oven to 350 F(180 C) and bake for about 30-45 minutes, until it turns lightly brown. Malzemeleri bir kaseye koyup karistirin. Bir kasede sut, yumurta, maden suyu ve sivi yagini karistirin. Bu karisimi her 2-3 tane pastri arasina/her yufka arasinda ve boregin ustu icin kullanacaksiniz.Tepsiyi yagladiktan sonra, 2-3 tane pastriyi/1 yufkayi tepsinin dibine kenarlari tepsinin disarisina cikacak sekilde yayin. 3 yemek kasigi sut karisimindan yayin ve kullandiginiz icten bir miktar alip esit sekilde yayin. Diger 2-3 pastriyi/ 1 yufkayi burusturarak tepsinin boyutlarina gore yerlestirin ve yine sutlu karisim ve icten koyarak elinizdeki pastri/yufka bitene dek bu islemi tekrarlayin (resime bakiniz).Son pastri/yufkayi koyunca en alttaki yufkayi tepsinin icine dogru kivirip boregin uzerini ortun. Boregi istediginiz buyuklukte kare parcalara dilimleyin ve geriye kalan sut karisimini esit sekilde boregin uzerine dokun. Susam ile corek otu serpin. Onceden isitilmis 180 C (350 F) firinda, uzeri hafifce kizarana dek, yaklasik 30-45 dakika pisirin. Oh wow I wish I had this now. I just discovered your excellent website. I already tried your "Borek with Seltzer" and was very impressed by it's taste. I used real yufka though. The good thing about it is that I didn't have to leave it in the fridge overnight like the other Sodali Boreks. Cok cok sagol. Your recipes are very healthy, tasty and nice to look at. Kariyerinde cok basarili olacagindan eminim. Not: Peynirli kek tarifin de varmi acaba?